You can fill your home with the uplifting fragrance of Omved Devotional Sandalwood and Loban to evoke spiritual bliss. This Aradhan incense set is a beautifully packaged set of two age-old incense sticks that will sanctify your puja rooms and their purifying aromas will enhance your spiritual practices and fill your home and you with a sense of divine bliss. This warm and engulfing aroma of Chandan/Sandalwood can help you relax your mind, soothe your senses and open your spirit to love while Loban, a deeply fragrant, light spicy-woody aromatic resin has been burnt since ages among ancient world cultures. 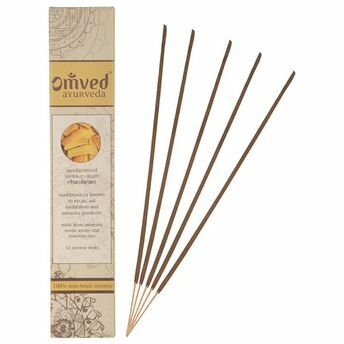 Infused with the abundance of nature these aromatic ingredients combine to produce a smooth, slow-burning incense. The result is a fresh and fragrant breath of conscious bliss.